California officials are unable to identify a grey, goo-like substance that has been found coating the feathers of hundreds of birds. More than 200 seabirds have been found dead along the coast, while more than 300 have been rescued so far. The strange, gooey substance degrades the water-repellent properties in the birds’ feathers, causing hypothermia from extended stays in the water. The seabirds – Surf Scoters, Buffleheads, Goldeneyes, and Horned Grebes – have been turning up dead or in need of rescue along 20 miles of coastline in the San Francisco Bay area over the past week. If they react quickly, rescuers can treat the birds for hypothermia and then wash off the goo with baking soda, vinegar and a chemical agent, then soap and water. Others are not so fortunate. “The birds tend to come into care needing hydration and medical stabilization, and we have a mandatory 24-hour stabilization process before cleaning,” spokeswoman Barbara Callahan of International Bird Rescue told CNN. Officials know the gooey substance is not oil because it would be far harder to treat, and officials think whatever the substance is, it was probably dumped. Hughan said the material is not a public health hazard; the birds died because they froze to death from loss of body heat – not because they were poisoned. Workers at International Bird Rescue have spent the week cleaning and reviving the birds affected. She said the rescue effort has cost the center some $8,000 a day. “Nobody’s paying because they don’t know what it is and they don’t have a responsible party. We’re footing the bill on our own,” Callahan said. There have been no reports or evidence of an oil spill. Tests are being conducted to try to identify what the substance is and where it might have come from. 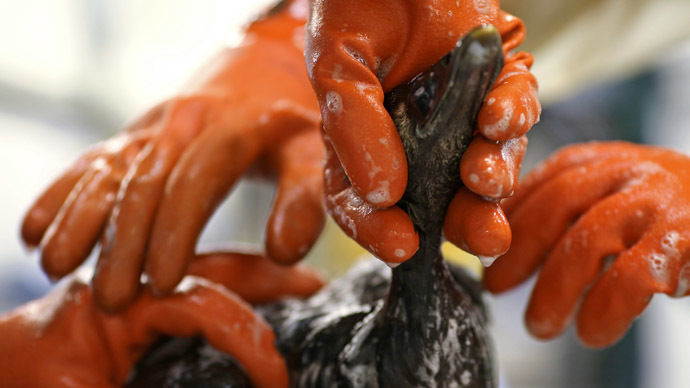 Initial thoughts were that the substance might be similar to the synthetic rubber fuel additive polyisobutylene (PIB), which was found to have led to the deaths of 4,000 seabirds in England in 2013. But officials said tests have ruled PIB out.